A man who hit the headlines after dressing up as Batman to hand a wanted man to police has been spared jail after being found guilty of burglary. 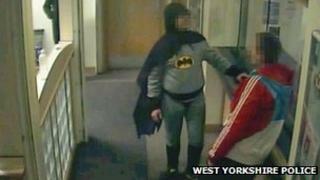 Stan Worby, from Wyke, Bradford, was caught on CCTV dressed as the caped crusader at the city's Trafalgar House Police Station in February. Worby, 40, was charged with burglary in April. He was sentenced to six months in jail, suspended for a year, at Bradford Crown Court. He was also ordered to carry out 200 hours unpaid work.